How to fight info-poor exclusion? Jointly organized by Lisbon Municipality (Culture Department) and CITIDEP, this Colloquium had more than 350 registered participants and 45 communications, among which 10 international guest speakers (France, UK, Germany, Sweden, Holland, Mexico, USA). 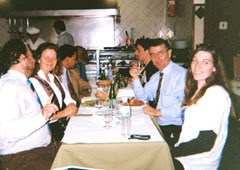 Communications from CITIDEP: Alejandro Natal (Colegio Mexiquense), Mel King (MIT and Tent City, USA), Pedro Andrade (U. Coimbra, Portugal) and Pedro Ferraz de Abreu (MIT, USA); as well CITIDEP friends Anne-Catherine Fritzinger (Bibliotheque Marseille, France), and Susan Stuebing (Twynstra Group, Holland). Ana Reis prepared a presentation on CITIDEP Citizenship Kit Project, but could not attend. At the Colloquium opening session, the Mayor of Lisbon, Joao Soares, after mentioning his long-time friendship and collaboration with CITIDEP President, expressed his strong support to the initiative and the Municipality's commitment to a strategic cooperation with CITIDEP on its drive to use new technologies to fight social exclusion, of which the work in progress towards building a new, modern, central public library for Lisbon was a good example. The President of the New University of Lisbon, Sousa Lobo, holding ICPPIT99's Book in his hand, praised the academic quality of this joint CITIDEP - DCEA/UNL publication, and expressed also the interest in pursuing the cooperation between CITIDEP and the New University of Lisbon, in line with initiatives like the past ICPPIT99 Conference, the book, and present Colloquium. 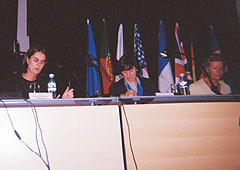 Besides the interventions of the organizers, Manuela Rego (CML Culture Dep. Head) and Pedro Ferraz de Abreu (CITIDEP President), spoke also at the opening Mel King (Emeritus MIT and CITIDEP Science Council) and Maria Calado (City CouncilWoman for Culture). 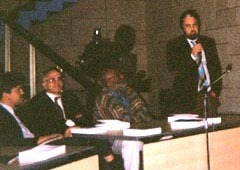 The Colloquium was videotaped and CITIDEP is considering a limited edition on CD by 2001. Communications sent by participants up to the end of November 2000 will be published in a "non-frills" Proceedings. As it was to be expected in this kind of meeting (no referee selection), there was a wide variety of presentations, with different depths. In general, interventions were well received, and all guest speakers made very interesting presentations. 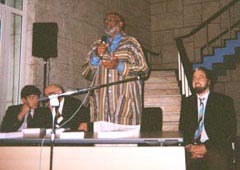 Thanks to an active participation of guest speakers like Mel King and others, the Colloquium's program was extended with an informal round table discussion. All international guest speakers were also invited to a formal Municipality dinner, and to an informal CITIDEP dinner party, which was very animated (check the photos). 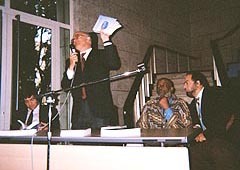 The Book "Public Participation and Information Technologies 1999", resulting from past year's International Conference (ICPPIT99) was presented during this Colloquium , immediatly after the formal opening. Besides ICPPIT99 Co-Chairs, João Joanaz de Melo and Pedro Ferraz de Abreu (CITIDEP President), presented the book Prof. Sousa Lobo, President of the New University of Lisbon (UNL), and Prof. Mel King, MIT Emeritus and CITIDEP Science Council member. The book includes a CD-ROM and is available for on-line orders in this web site. As part of the Colloquium program, there was a live videoconference between the Forum Lisboa and Healey Library at the University of Massachusetts / Boston, the 13 October. Presentation - Ann McLaughlin, Director, Quincy Public Libraries, "The Mission of a Public Library: New Strategies for Modern Library Services"
The Videoconference, after a technical scare (20 minutes late connection), was a live, interesting one hour discussion with both sides well engaged in question/answer/comment dialog, after an outstanding presentation by the speaker and relevant introduction remarks from Boston side. Portuguese Television filmed the videoconference, and interviewed Lisbon City CouncilWoman for Culture, Maria Calado, and CITIDEP President, Pedro Ferraz de Abreu. CITIDEP-USA Committee will send additional information on this first formal CITIDEP cooperation with U.Mass. On Lisbon side, all feedback we received from panel participants and audience members was extremely positive, non-withstanding technical difficulties.